I'm looking for help/advice on building a website. Are there good programs for the do-it-yourself person? I see GoDaddy has something on their site about building a page. Anyone ever use it? Comments? Do you know someone that does this and can recommend them? What is the ballpark pricing/range of pricing one could expect to have a website done by a pro and what comes with it? How do you handle updates? How frequent can you update? The most common do it yourself method today is through a venue called Wordpress. They have a few custom themes where one can edit the content of their website, plus paid for themes that may look better than the free ones. You would then have to consider buying your domain name and hosting... which could be free through Wordpress, but your name would be, for example, http://www.evildan.wordpress.com... which in my opinion is sort of crappy looking. On average, you would be looking at 15 to 30 dollars a year for a domain name and the hosting for your website. One thing to mention though, is I am not too sure how tech savvy you are, and while wordpress is non-programmer friendly, it may seem daunting to the non-tech person at first glance. Ive been teaching myself web programming for the last 6 months now, hence why I know of those options, but I have no idea what professional web design would cost. Feel free to ask me if you have any questions though. I don't want to go through wordpress or other sites like that. I have the domain name via GoDaddy. I used to host through another site, can't think of the name right now, but looking to do it through GoDaddy at this point since it would be easier to maintain. I'm looking to get a site built for my wife. 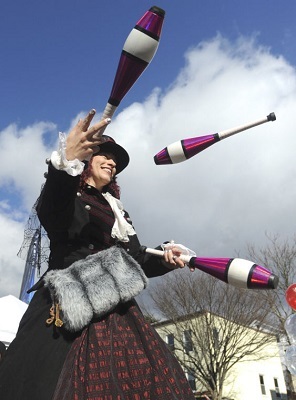 She's known as the juggling stilt walker in this area and many people look forward to seeing her at various events around the area. She's become somewhat of a tradition for many people. She also has other skills and I'm looking to build a site that offers that as well. Magic show - Face Painting - Balloon Animals - etc. 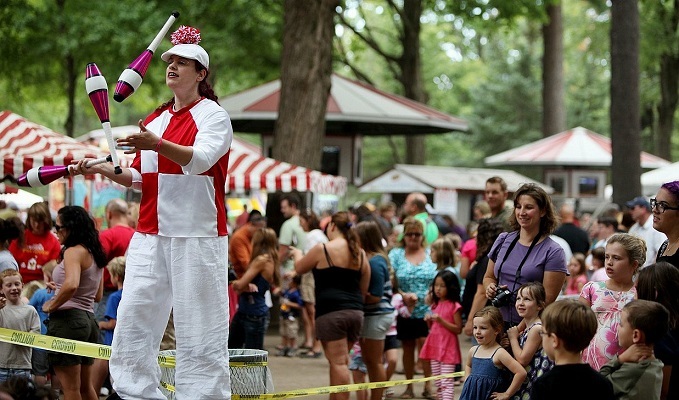 So the main site would be for Sparkles, the Tall Juggler. Links to other pages/services off that main page. Right now she's getting work via word of mouth for birthday parties that combine some of her skills. I want a site for her where people can see examples of her work. Two shots I found on the web. OK, so it would be a simple static site with 5 or 6 pages off a main menu bar? You'd display photos, single or within a slider (where photos change automatically) and some videos? You could do it yourself using a tool which is free for creating static websites to up to 10 pages, which might be your case. I suggest you see the demos online. It's a tool I use in my professional work and is quite good. If you ever wanted to allow people to leave posts on your site etc the same code base would work unchanged. If you wanted to scale it up and port it to WordPress, Joomla etc..., yet again it would quite straightforward. You can allow viewers to leave posts, but it's a feature you can disable easily. You can download free templates (html templates) from the site too: make sure to check html and free in the criteria. If you don't like this, I could suggest more options but I would recommend you try it first as the code generated by the GUI will run unchanged on practically all devices: PCs, tablets, smartphones, in IT jargon it's called responsive. Updating the site would be straightforward as all you'd have to do would be to upload whatever had changed. Check with Jonathan Levit. He helped me rebuild my website. He has a number of pre-designed templates and the cost is very reasonable. Just read the Terms and Conditions for Themler, it's for non-commercial use. This would be a commercial site. There's a lot involved with making a website, unless you're skilled at graphic design, web design, marketing, graphics, writing, SEO, coding, etc, it's best left to the professionals. Figure out which parts you're good at and find others to help with the parts you don't feel comfortable with. I don't think that's the case. They're talking about the content of their website (as they provide thousands of images (free or paying)). Please provide me with the link where you read this. I have bought a license of their product so I am not concerned personally, but I am perplexed. There are many other tools to develop websites depending on your skill/knowledge level. If you Google "best free site builders", you should be getting some info. I used to use CoffeeCup.com's HTML Editor. I don't recall if they have a free version, but the paid version served me very well. They have additional packages you can buy, such as a shopping cart. I used the shopping cart for close to 10 years to sell my magic books, before I decided recently to stop selling them and rejoin the hobby. We magicians all want something for nothing (i.e. the least expensive website solution). We magicians, being all knowing, believe we can be our own show technicians (sound/lighting), costume and make-up artists, marketing/business experts, and, of course, website developers. Let's face it...there are four primary ways to create and maintain a magician's website - all of which require varying levels of investment (time and/or money). There is nothing worse than a website which is static, and shows its age from lack of style and technology advancements. You have a careful balance between technology, and content. 1. Create and maintain your own website. Are you a graphic artist? Are you an HTML/CSS/PHP/Java/Python programmer? Do you understand how to implement patch updates for web programming languages, and have time to implement them, and update your code when necessary? 2. Use an established web development tool, which is easy to learn, and use to maintain your web site content. This places the burden of the system/language patches on the web hosting service. Be weary of custom development environments - better to separate your hosting service from your development environment (i.e. Do not use GoDaddy for both!). 3. Have a professional create your website, creating it in such a way that you can maintain the content easily. You can then call upon the professional as often as required for the technology requirements, and for your occasional upgrades on the look and feel. 4. Pay a professional for EVERYTHING. None of us will do that...until we have a Las Vegas show. I am an Information Systems Analyst, and have been a computer programmer most of my life, including a web application developer. Yet I do not yet have my own website. My choice? I am taking a giant step backwards in order to learn a web site development environment (paying enough money to keep the ads off my site), and I will implement on a separate web hosting service (which happens to include the cost of a domain purchase). I will develop my own site in a development environment...then maintain the content myself. All because I do not yet have a Las Vegas show.